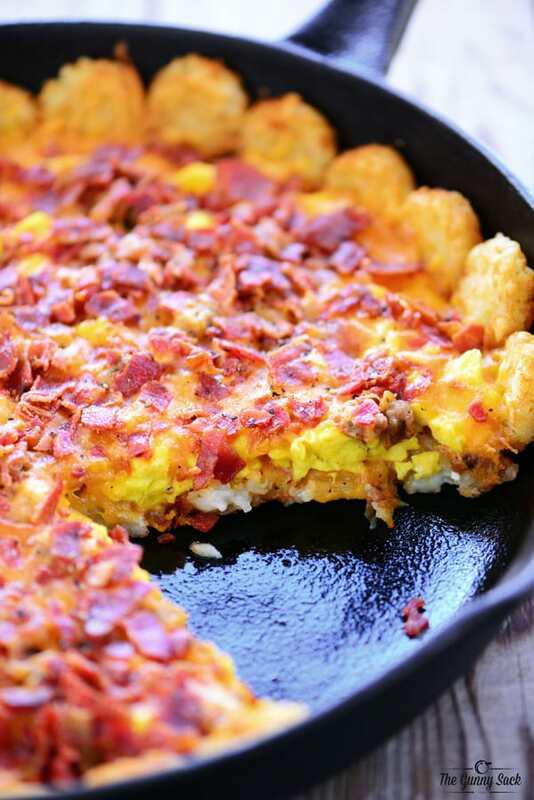 This delicious recipe for breakfast pizza with a hash brown crust can be made for breakfast or as an easy dinner. 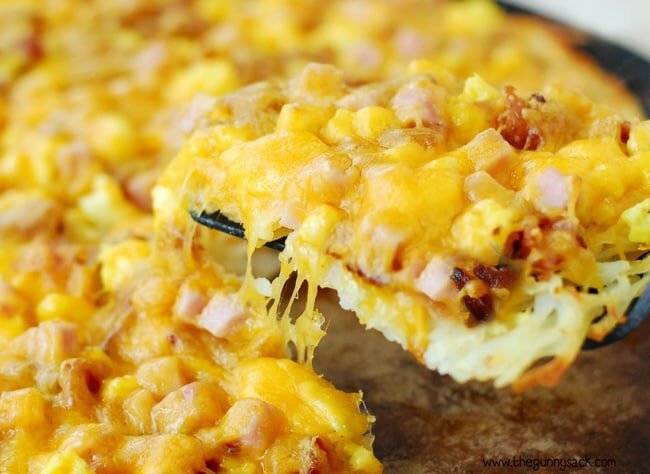 It is topped with bacon, ham, and cheese. This post brought to you by Simply Potatoes. All opinions are 100% mine. Growing up, one of our favorite things to have for dinner was breakfast! We loved anything from pancakes to waffles and French toast to fried eggs. French toast was my dad’s specialty and it is what he would make us on those rare occasions when my mom wasn’t home to make dinner. My husband and kids love breakfast any time of the day. Our favorites include omelets, egg bakes, pancakes and breakfast sandwiches. And of course, everyone’s favorite side dish is breakfast potatoes! Potatoes are kid-friendly because they taste good. Mom’s love them because they are easy to prepare and it is a great way to sneak in some nutrition! 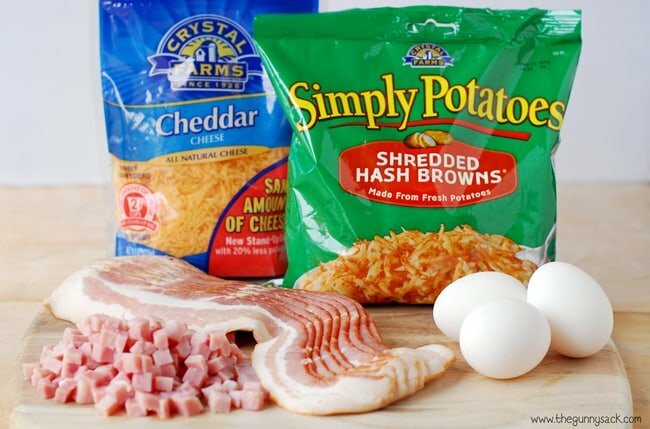 This recipe starts with Simply Potatoes Shredded Hash Browns. Simply Potatoes are my go-to potatoes for family breakfast solutions. I also use them in casseroles and when I make soups like my slow cooker chicken pot pie soup. I love the convenience! There’s nothing to peel or shred and I save on dishes. 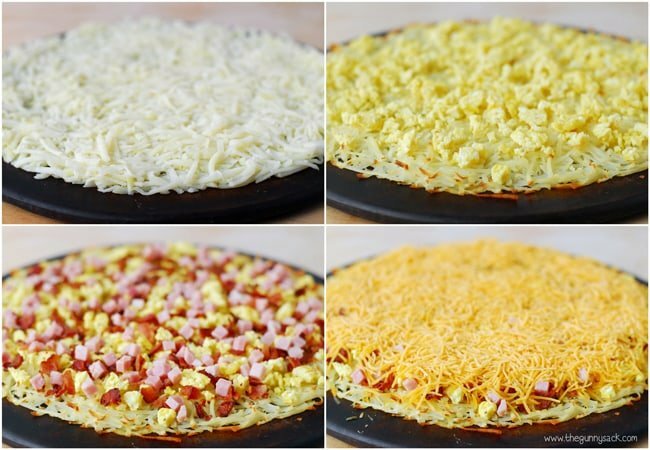 Spread the shredded hash browns out on a stoneware pizza pan and press into a pizza crust shape. Drizzle with 2 tablespoons of melted butter. Sprinkle with salt and pepper. While the crust is baking, fry eight slices of bacon and cook three scrambled eggs. Remove the crust from the oven and sprinkle with the scrambled eggs. Next, crumble the bacon and sprinkle it over the eggs. Follow the bacon with the diced ham and any other toppings your family loves such as onions, peppers or mushrooms. Finally, top it all with shredded cheese. Return the breakfast pizza to the oven and bake for an additional 20-25 minutes. My family loved having a delicious, warm, cheesy breakfast! I love how easy it was to make. It was such a big hit that I am going to make it for dinner one night when everyone is home to enjoy it. Also, with the holidays just around the corner, this would be a great meal to serve overnight guests! 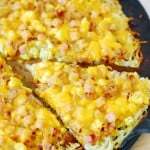 This delicious recipe for breakfast pizza with a hash brown crust can be made for breakfast or as an easy dinner. It is topped with bacon, ham, and cheese. 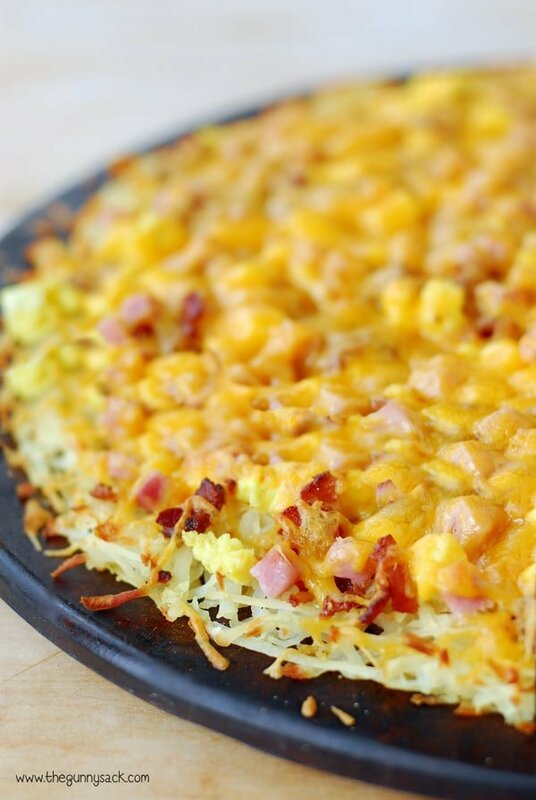 Spread the hash browns out on a stoneware pizza pan and press into a crust shape. Drizzle with two tablespoons of melted butter. Sprinkle with salt and pepper. Bake at 425˚F for 20-25 minutes. 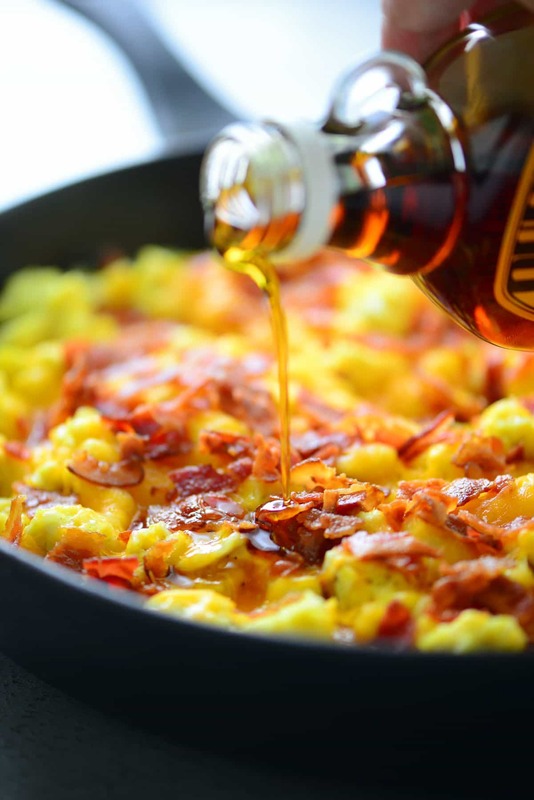 While the crust is baking, fry the bacon and cook the scrambled eggs. Sounds wonderful! Silly question, but I assume when you say “scramble the eggs” you mean to scramble them & cook them also? I only ask because my recipe uses raw, scrambled eggs, but hash browns on top, so getting soggy would not be an issue. Thanks for your time! Yes, I used cooked scrambled eggs. I updated the instructions so hopefully it is more clear. Enjoy! It would be great to have the photo of the food on the recipe. So many times I forget just what the end is going to look like and the photo helps alot. Thank you Tonia for this delicious recipe. Happy Valentine Day to you and your family. I had this and it was DELICIOUS!! How many cups of hash browns? I buy a 1 1/2 pound bag and not sure how much to use. I just made this for my fam and it was a definite hit! Thanks for sharing!!! I made this last night for my small family of 7….it was a huge success even with all my picky little eaters! I just made this and let me tell you, this is so good!!! thanks so much for sharing! I changed things a little because I read Rosemary Davis comment and it sounded good. Thank you! 1/2 bag frozen hash browns and thawed in the microwave. Baked at 425 on pizza stone for 25 min. While baking I fried ground sausage with chopped frozen onion and chopped red peppers – then let it set to drain in fine strainer. Scramble 4 eggs seasoned with garlic salt – but leave them very soft. Top hash browns with sausage mixture, then top with softly scrambled eggs. This was amazing! I made it last night for dinner and my husband thought it was genius! Can’t wait to make it again! Fantastic! Thanks for stopping back to let me know! Could olive oil or coconut oil be substituted? Is it possible to freeze this when done, and reheat? Yes, you could use another oil and yes, I think that it would freeze well! Enjoy! I dont have a pizza stone. Will it work just as well on a pizza sheet or cookie sheet? Yes, you can use a cookie sheet! Enjoy! Can you use fresh potatoes that are grated as hash browns? I realize that this post is a commercial for Simply Potatoes but we prefer to use fresh unprocessed ingredients when possible. The recipe looks great. Yes, you can use your own grated hash browns! Enjoy! How many potatoes would you use. I cant see a size amount on the package. Sorry if its there and im overlooking it. I’m not sure how many ounces are in the package but the nutrition facts on the Simply Potatoes website says that there is 3 1/2 cups of potatoes in the package. OK thank you. I believe one cup is 8 oz if that is ever reliant in the future for you. Forgot to rate! Five stars for sure! I made this on Christmas morning and it was a hit! I used half a bag of frozen hash browns (for those who asked about in previous posts) and it came out perfect. I also just scrambled the egg and poured the egg over the crust once baked and added the toppings and baked again as instructed instead of of scrambling and cooking prior to baking a second time. The result was very tasty. Thank you for sharing this recipe, it’s a keeper for sure!! Oh my goodness; this looks amazing! I just bought a pizza stone last week and have been anxious to try it out. OMG!!! Just made this for our breakfast and it is delicious!!! Not a single crumb left! I played with the toppings on it for each persons like or dislike and we all just loved it! Will be on the menu for Christmas night breakfast! Why does it have to be baked for so long the second time? Don’t the eggs get rubbery after continuing to cook for another 25 minutes? Have you e er tried adding any veggies like onion, peppers? I love crunchy hashbrowns and this sounds neat! I like the hashbrowns to be well done, the cheese has to melt and the ham has to get hot. My eggs did not get rubbery because they were covered with cheese. I have not tried adding veggies because my family is picky but I would love it! Can this be made a day or two ahead? I’ve never tried making it ahead of time but I did eat the leftovers! have you made this ahead? i wanted to bring it for christmas morning to my grandma’s house but i won’t get there until 11 am, do ou think it would hold up if i made the crust and toppings ahead of time, stored them seperately and had her put it al together and bake that morning? New to using frozen hash browns. Should I thaw them first for this dish…can’t tell and similar recipes with them vary. Excited to make these! I am dipping it in ranch! This sounds and looks delicious! 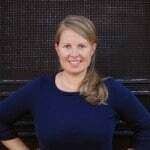 I’ve just started reading your blog and love it! Have you ever tried a “sauce”? I love country gravy and can’t help to picture it on this pizza! Can’t wait to try! Thanks!! Thank you! I’m so happy you are here! I’ve never tried this recipe with gravy but that does sound delicious! 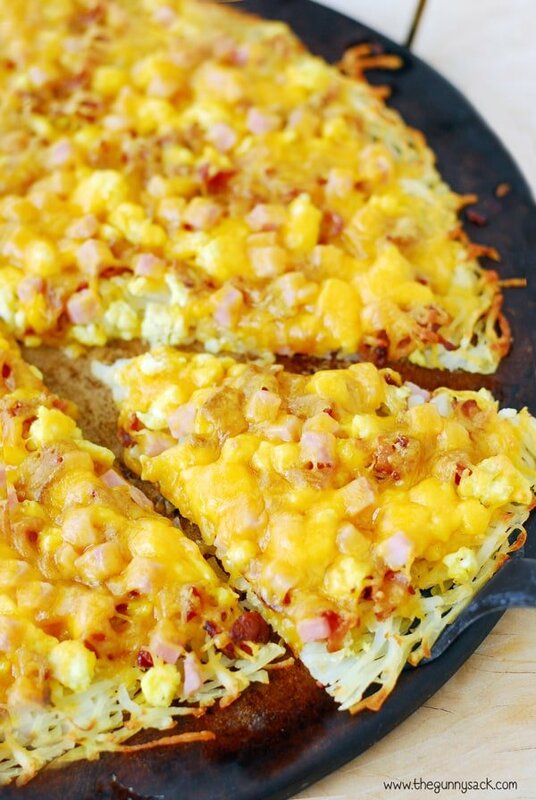 Love the idea of a breakfast pizza… made from hash browns! Thank you Tonia for the nice recipe. What a great idea. Have a great weekend. We love breakfast for dinner, and I love this potato crust. Makes a perfect gluten free breakfast pizza!